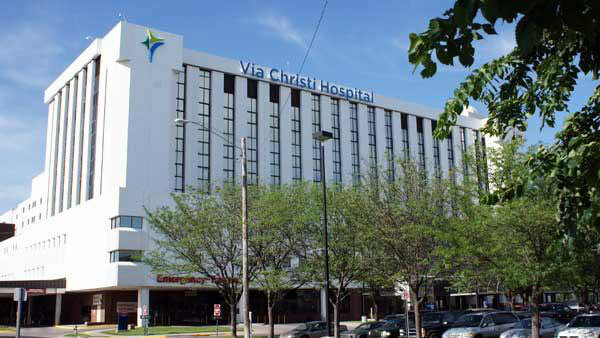 Patients will move into the all-new 7SW general and bariatric surgery unit at Via Christi Hospital St. Francis on Monday, renovated as part of a master facility plan to convert Via Christi’s St. Francis and St. Joseph hospitals to private beds by late 2016. The new unit features 18 private patient rooms, four of which are dedicated to bariatric surgery patients; two double-occupancy rooms to allow for continuous monitoring; one room equipped with a track to assist in moving patients who need maximum assistance in moving from their bed to the bathroom; and a reconfigured workspace designed for optimal efficiency in collaboration among physicians and clinicians. Single-patient rooms where families can visit comfortably with the patient or confer privately with doctors and clinicians. Remote controls for window blinds, lights and televisions. Sleeping couches for family members staying overnight. Large closets with in-room safe for valuables. Spacious bathrooms with roll-in showers and other safety features. Overhead lift tracks to help clinicians move patients of all sizes from the bed to the shower or toilet and back. Plug-ins and USB ports for computers and cell phones for patients and their families as well as clinicians. Two family sitting rooms with adjoining public restrooms. A calming, nature-inspired décor throughout. Additionally, the traditional central “nurses’ station” has been replaced with “computer cubbies” just outside each patient’s room where the phones blink rather than ring to keep noise levels low day and night. Inside patient rooms are wall-mounted staff computers with adjustable arms that allow nurses and other clinicians to sit and face patients while updating their records in real time, increasing work efficiency for staff and providing relaxed face time with patients.